What the motivations are for implementing an application using MVVM. What the MVVM pattern is. The benefits that the MVVM pattern provides. The MVVM pattern lends itself naturally to XAML application platforms such as Silverlight. This is because the MVVM pattern leverages some of the specific capabilities of Silverlight, such as data binding, commands, and behaviors. MVVM is similar to many other patterns that separate the responsibility for the appearance and layout of the UI from the responsibility for the presentation logic; for example, if you're familiar with the Model-View-Controller (MVC) pattern, you'll find that MVVM has many similar concepts. Development technologies like Windows Forms, WPF, Silverlight, and Windows Phone provide a default experience that leads a developer down the path of dragging controls from a toolbox to a design surface, then writing code in the form's code-behind file. As such applications grow in size and scope and are modified, complex maintenance issues begin to arise. These issues include the tight coupling between the UI controls and the business logic, which increases the cost of making UI modifications, and the difficulty of unit testing such code. It provides separation of concerns. Tightly coupled, change resistant, brittle code causes all sorts of long-term maintenance issues that ultimately result in poor customer satisfaction with the delivered software. A clean separation between application logic and the UI will make an application easier to test, maintain, and evolve. It improves code re-use opportunities and enables the developer-designer workflow. It is a natural pattern for XAML platforms. The key enablers of the MVVM pattern are the rich data binding stack of the Silverlight platform, and dependency properties. The combination of these provides the means to connect a UI to a view model. It enables a developer-designer workflow. When the UI XAML is not tightly coupled to the code-behind, it is easy for designers to exercise the freedom they need to be creative and make a good product. There are three core components in the MVVM pattern: the model, the view, and the view model. Each serves a distinct and separate role. The following illustration shows the relationships between the three components. In addition to understanding the responsibilities of the three components, it's also important to understand how the components interact with each other. At the highest level, the view "knows about" the view model, and the view model "knows about" the model, but the model is unaware of the view model, and the view model is unaware of the view. The view model isolates the view from the model classes and allows the model to evolve independently of the view. The view is responsible for defining the structure, layout, and appearance of what the user sees on the screen. Ideally, the view is defined purely with XAML, with a limited code-behind that does not contain business logic. In a Windows Phone application, a view is typically a page in the application. In addition, a view could be a sub-component of a parent view, or a DataTemplate for an object in an ItemsControl. A view can have its own view model, or it can inherit its parent's view model. 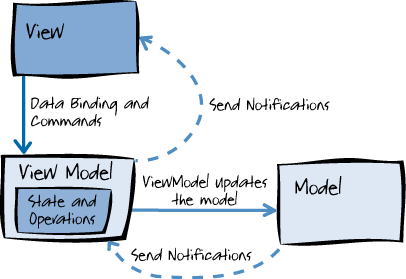 A view gets data from its view model through bindings, or invoking methods on the view model. At run time, the view changes when UI controls respond to view model properties raising change notification events. There are several options for executing code on the view model in response to interactions on the view, such as a button click or item selection. If the control is a Command Source, the control’s Command property can be data-bound to an ICommand property on the view model. When the control’s command is invoked, the code in the view model will be executed. In addition to commands, behaviors can be attached to an object in the view and can listen for either a command to be invoked or event to be raised. In response, the behavior can then invoke an ICommand on the view model or a method on the view model. The model in MVVM is an implementation of the application's domain model that includes a data model along with business and validation logic. Examples of model objects include repositories, business objects, data transfer objects (DTOs), Plain Old CLR Objects (POCOs), and generated entity and proxy objects. The view model acts as an intermediary between the view and the model, and is responsible for handling the view logic. Typically, the view model interacts with the model by invoking methods in the model classes. The view model then provides data from the model in a form that the view can easily use. The view model retrieves data from the model and then makes the data available to the view, and may reformat the data in some way that makes it simpler for the view to handle. The view model also provides implementations of commands that a user of the application initiates in the view. For example, when a user clicks a button in the UI, that action can trigger a command in the view model. The view model may also be responsible for defining logical state changes that affect some aspect of the display in the view, such as an indication that some operation is pending. In order for the view model to participate in two-way data binding with the view, its properties must raise the PropertyChanged event. View models satisfy this requirement by implementing the INotifyPropertyChanged interface and raising the PropertyChanged event when a property is changed. Listeners can respond appropriately to the property changes when they occur. For collections, the view-friendly System.Collections.ObjectModel.ObservableCollection<T> is provided. This collection implements collection changed notification, relieving the developer from having to implement the INotifyCollectionChanged interface on collections. MVVM leverages the data-binding capabilities in Silverlight to manage the link between the view and view model, along with behaviors and event triggers. These capabilities limit the need to place business logic in the view's code-behind. There are many approaches to connecting a view model to a view, including direct relations and container-based approaches. However, all share the same aim, which is for the view to have a view model assigned to its DataContext property. Views can be connected to view models in a code-behind file, or in the view itself. A view can have code in the code-behind file that results in the view model being assigned as its DataContext property. This could be as simple as a view instantiating a new view model and assigning it to its DataContext, or injecting a view model into a view using an inversion-of-control container. However, connecting a view model to a view in a code-behind file is discouraged as it can cause problems for designers in both Visual Studio and Microsoft Expression Blend® design software. If a view model does not have any constructor arguments, the view model can be instantiated in the view as the view’s DataContext. A common approach to doing this is to use a view model locator. This is a resource which exposes the application’s view models as properties that individual views can data bind to. This approach means that the application has a single class that is responsible for connecting view models to views. In addition, it still leaves developers free to choose to manually perform the connection within the view model locator, or by using a dependency injection container. For more information about MVVM, see these chapters in the Prism documentation: Chapter 5, Implementing the MVVM Pattern and Chapter 6, Advanced MVVM Scenarios.